Following on from the Advance Queensland Regional Forum in Rockhampton, Chief Operating Officer, Richard Chappell, accepted an invitation from the Queensland Premier to attend the inaugural Advance Queensland Innovation & Investment Reception in Brisbane. The Reception brought together over 200 guests where the theme ‘Preparing Queensland for future innovations’ was the focus of the evening giving invitees the opportunity to be a part of the Advance Queensland innovation movement. Premier Annastacia Palaszczuk outlined how Advance Queensland was at the heart of her government’s agenda and how its focus on harnessing innovation, ingenuity and creativity would create a new economy for Queensland and take the state further, faster. 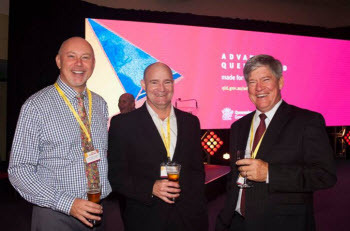 Richard Chappell – 101 Business Applications, Don Sands – Synengco, and Derel Wust – 4Tel at the Advance Queensland Innovation & Investment Reception.